Beltane is is the second fire festival of the Celtic year for pagans following the Wheel of the Year. It is also the third and final spring festival of the year (celebrating the height of spring), and the beginning of Celtic summer. Occurring around May 1st in the Northern Hemisphere, some people celebrate Beltane when the local hawthorn trees are in bloom (even though this now occurs in mid-May since the adoption of the Gregorian calendar), or on the full moon nearest this event. The earth has had a chance to warm up again since winter, plants and animals are active, and fertility and the bright green of new growth is everywhere. In pastoral tradition, livestock was turned out to summer pastures at Beltane. 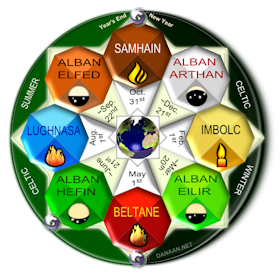 Beltane occurs 6 months after Samhain, and in the Celtic way of looking at the seasons marks the end of winter (the ‘dark’ half of the year) and the beginning of summer (the ‘light’ half). Like Samhain, Beltane is a liminal (between) time, when the veil between the worlds is thin- considered a good time for divination and particularly for seeing the Fair Folk (the Fae). The Irish pagan festival of Beltane, held on the 1st day of Summer (May 1st), lies at the root of the May Altar. Symbols of growth and fertility are placed on the altar in a celebration of the season. The tradition of making a home altar on this date dedicated to the Virgin Mary continued in rural Ireland until around the 1960’s. A Maypole is usually a freshly cut tree trimmed to a pole that is decorated at the top with wreaths, strung with long ribbons, and erected in a clear area large enough for dancers, musicians, and spectators around it. (There are also permanent Maypoles in some towns in Europe.) 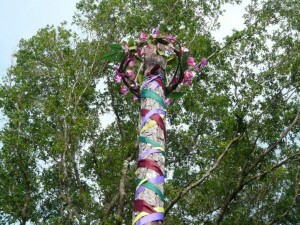 Dances are done with the ribbons around the Maypoles, and include circle or interweaving dances. The Maypole can be considered a symbol of the world axis (or axis mundi), and as a regenerative phallic symbol. Maypoles are common for school children in Europe (as they used to be in the United States), and are easy to make. Here is a tutorial on making a Maypole. Many observe the traditional bonfire rites, including the dousing of the household hearth flame and relighting it from large communal bonfires, known as a need–fire, kindled from 9 sacred woods. After these fires die down some, livestock is driven between them for protection and fertility. People likewise dance around or jump over (small) fires, or burn offerings in them. Celebrations included the hanging of May Boughs on the doors and windows of houses and the making of May Bushes in farmyards. These usually consisted of green budding branches of trees like rowan (mountain ash), furze, or more commonly whitethorn (hawthorn) which is in bloom at the time and is commonly called the ‘May Bush’ in both Ireland and Britain. May baskets are filled with flowers and left for those who need caring and healing. 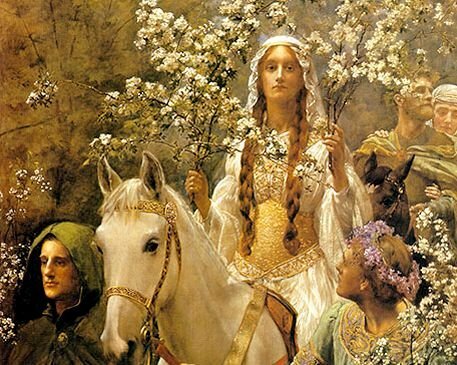 Many Pagans celebrate the fertility of the land with a symbolic sacred union of the May Queen (a personification of the Earth Goddess) and the May King (a personification of the Vegetation God, or Jack-in-the-Green). Walpurgis Night (Central & Northern Europe)occurs six months from All Hallow’s Eve (October 31st), and spring is welcomed with dancing and bonfires on April 30th or May 1st. Floralia (Pagan Rome, April 27th-May 3rd) is a festival to honor the goddess Flora, a goddess of flowers, vegetation, and fertility. Bona Dea (Pagan Rome, May 1st) features offerings were made to this “good” goddess. Maia (Pagan Rome, pagan Greece) was the Roman Goddess of Increase (or a Greek Pleiades- nymph- and the mother of Hermes, from whom May gets its name). Roman Catholic traditions of crowning statues of Mary with flowers on May 1 has roots in this and other Pagan holidays. Belenus — many believe Beltane honors the ancient continental Celtic sun and healer God, Belenus (also known as Bel,or Belin). Bel was known as the ‘Bright One’ and the god of light and fire. Early scholars put the Irish cognate Beli’s feast day on May 1st, though opinions now vary on this. In the version of the Ogam tree alphabet calendar popularized by Liz & Colin Murray (1988), the seventh lunar ‘month’ of the year is in May. This month starts with the festival of Beltane, at the nexus between spring and Celtic summer. The Ogam tree associated with this month is the oak, or the Ogam letter Duir. Duir, offers solid protection, inner strength, and is a doorway to mysteries. (Many large oaks have voids at their base that actually appear to be doorways.) Oaks are subject to more lightning strikes than trees of comparable height, which made them sacred to various sun and thunder gods (Dagda, Taranis, Zeus/Jupiter, and Thor among them). Oaks foster a wide range of other plants and animals, while providing wood, acorns, and other products. Individual oak trees and groves were widely revered in Europe, and oaks are commonly featured in place names. 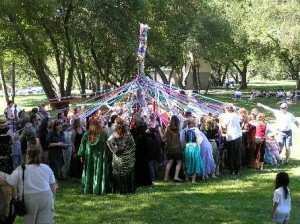 Here is a gallery showing how Beltane is kept as a holiday now – celebrations, observances, and music included. There’s a new cut of the original 1973 mystery movie Wicker Man [Blu-ray] . Not so accurate on Pagan ways, but a fun campy musical none the less. Bona Dea (2014) in Wikipedia. Freeman, M. (2001). Kindling the Celtic Spirit. San Francisco: Harper Collins. May devotions to the Blessed Virgin Mary (2014) in Wikipedia. Murray, L. & C. (1988). The Celtic Tree Oracle: A System of Divination. London: Rider & Co. Ltd.
Order of Bards, Ovates & Druids. (2001). Beltane Ceremony of the Order of Bards Ovates & Druids. East Sussex: Author. Paterson, J. (1996), Tree Wisdom, The Definitive Guidebook. London: Thorsons. Obby Oss May Song, retrieved from the Cornwell Guide website. Walpurgis Night (2014) in Wikipedia. This Beltane page was originally published on 3-2-2013, with many revisions since then.